Constructed of tough, glass-filled Nylon™ for best weather resistance. Cord strain relief firmly secures cable. 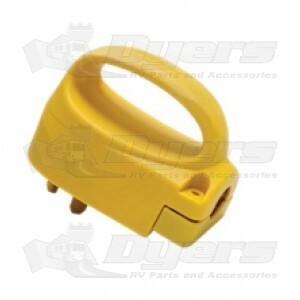 Wide grip handle allows user to safely and easily remove plug from outlet. ETL approved to UL standard 498. Seems sturdy and arrived faster than I expected. Only problem is that it is too large to fit into the standard 3-1/4 inch utility box opening in the trailer. I will have to return it and get a standard sized replacement plug. This plug is very rugged and will be a definite improvement over the original plug on my power cord.